Sure to be a cultural cornerstone of the season, don't miss this rediscovered and restored classic operetta masterpiece. Performed with a cast of 20 and 14-piece orchestra, The Golden Bride will debut to an audience for the first time in 70 years! Whirled Music at the Barnes! Matt Darriau (Klezmatics, Paradox Trio) leads his Bulgarian goat through new and used Balkan bagpipe music in a post-Paradox electric vein. Like any good shepherd he will wrangle an eclectic flock, featuring some of Brooklyn's finest Balkanites: Matt on gaida and alto, Jessica Lurie - bari sax, Seido - drums, Ari Folman-Cohen - bass, Yoshie and Avi - guitars. Every Sunday Morning, combining live music and food in a fresh, cultural environment, City Winery’s Klezmer brunch series pairs some of the greatest musicians in the world with delicious lox, bagels and other tasty fare on Sunday mornings from 11am to 2pm. City Winery's brunch on Jan 3 features Allen Watsky & the Djangle Box Project. 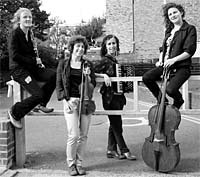 Join Ilana Cravitz and friends for a new monthly Klezmer session at The Harrison in Kings Cross. First Sunday of every month, 8-10.30pm on the Ground Floor. Come dance the hora with us! A night of instrumental Klezmer music and Yiddish folk songs. January 8th's performance will be part of a continuing Klezmer series 2nd Fridays after Shabbat services 9-11pm at RADIO Coffee and Beer on Man-shack just north of Ben White. Le Samedi 09/01/2016 à sevran (93) dans le cadre d'une deuxième programmation au sein de la saison culturelle. The Klezmer Music Foundation supports the Junior Klezmer Orchestra, which helps to pass along traditional Jewish music from generation to generation. Please come to hear our music and support this organization. Stay for a dessert reception and bake sale after the show! This new monthly series will feature women writers of fiction, nonfiction, memoir, poetry, and other genres who will read from or perform their work and engage in dialogues with audience members. a full-length musical review with Cantor Arik Luck, singers Sari Greenberg and Cantors Billy Tiep, Roslyn Barak, and Marsha Attie, and a seven-piece band. Tickets: $22 seniors, students / $25 general. Acclaimed klezmer violinist/composer/educator Steven Greenman will lead a klezmer music masterclass for Carleton College's World Music Chamber Ensemble. Music taught to include East European Jewish instrumental folk music (klezmer), Yiddish song and one Romani (Gypsy) melody. In this captivating collaboration, internationally acclaimed musicians Steven Greenman (violin) and Gao Hong (pipa) weave a braided tapestry of musical impulses through improvisation, the use of ancient musical modes and contrasting rhythms inspired by both traditions. Pre-concert Discussion/Demonstration at 6:30 p.m.
Klezmer scales, rhythms, melodies, and ensemble skills for all instruments and levels. Tuition: $130 for the session. $120 for early enrollment. ZLATNE USTE GOLDEN FESTIVAL 31 YEARS AND COUNTING! On January 15 and 16th, 2016, Brooklyn's Grand Prospect Hall will again come alive with the music, song, and dance of the Balkans (and well beyond) as some 60 bands and 3000 revelers gather for the 31st annual Zlatne Uste Golden Festival. Anchored in Balkan traditions (roughly Romania to Greece, Croatia to Turkey), and venturing generously beyond (this year including Yiddish Zingeray and Michael Winograd! ), the programming spans the ancient and the experimental, the oud and the synthesizer. It’s a pop-up community where young and old, the folklorist, music professional, and party animal come together in two nights of joy. In this captivating collaboration, internationally acclaimed musicians Steven Greenman (violin) and Gao Hong (pipa) weave a braided tapestry of musical impulses through improvisation, the use of ancient musical modes and contrasting rhythms inspired by both traditions.As a special addition to this concert, Greenman and Gao Hong will be joined by members of the Carleton World Music Chamber Ensemble performing repertoire learned during Greenman’s master class. There will be a brief introduction to the music and a walkthrough of a song followed by jamming. No experience necessary, just bring an instrument and willingness to learn and jam! Must be 21+ with valid gov't ID to enter. song & klezmer dance tunes. Our next klezmer jam will be Wednesday, January 20, 2016, from 7:30 to 10:00 with a potluck soup and snack break around 9. This will be an all-request evening. 9705 1st Ave NW, Seattle. All instruments and levels welcome. Sheet music is provided. An elegant evening of wine, music, storytelling to honor our volunteer mikveh guides, who pour their hearts into the work of facilitating powerful, transformative experiences. Featuring delicious, local, and kosher hors d'oeuvres by Moss Café, powerful storytelling performances about mikveh and transformation, music by guitarist Yoshie Fruchter & violinist Alicia Svigals, and hosted by Shira Kline, ritual leader of Lab/Shul. איר זענט האַרציק פֿאַרבעטן אויף אַן אינטערעסאַנטער לעקציע פֿון אַ היימישן מבֿין, ר' וואָווקע, "די וועלט פֿון חסידישער מוזיק". אין דער מוזיקאַלישער פּראָגראַם: אַ חסידישער בל-מנגן. אַרײַנגאנג: $5, פֿרײַ פאַר מיטגלידער. Entertainment free with $5 minimum purchase. An all-star supergroup resurrects Yiddish songs from World War II that were thought lost to history until U of T professor Anna Shternshis discovered them sealed in Ukrainian archives. From a collection of thousands, the most heartfelt and defiant songs have been selected and arranged for their premieres – featuring Russian singer Psoy Korolenko and the virtuosic trio Loyko from Russia, and acclaimed Canadian artists: singer Sophie Milman, accordionist Shalom Bard, clarinetist Shalom Bard, trumpeter David Buchbinder, and young singer Isaac Rosenberg. Note NOVEL LOCATION, due to renovation of usual venue Memorial Union. THE MONEY: Folk Ball is funded solely by your GENEROUS DONATIONS. Come and go as you please, but do bring CASH, bring your CHECKBOOK, your FRIENDS! Make a single full-weekend contribution at Info Table in Varsity Hall (checks to "Madison Folk Dance Club") or donate at each event you attend, but DO YOUR PART to keep Folk Ball an open, free-flowing celebration. THANKS!